Ocean First, a B:CIVIC business, and certified B Corp is a dive shop committed to doing their part not only by going green, but also through giving back to communities and educating student through their institute, the Ocean First Institute. One way they give back is through waste diversion. 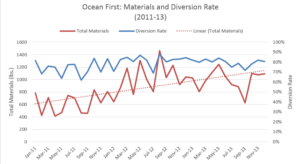 Since 2011, Ocean First has been tracking the amount of rubbish they produce and diverting it from the landfill while saving valuable resources. Located in Boulder County, they have taken part in Eco-Cycle’s Zero Waste Program. “A Zero Waste System is cyclical, like in nature, and does two fundamental things: It redesigns our systems and resource use—from product design to disposal—to prevent wasteful and polluting practices.. It then captures discards and uses them, instead of natural resources, to make new products, creating far less pollution and feeding the local economy.” Learn more from Eco-Cycle Here. Recently receiving their diversion metrics from 2017, Ocean First was proud to share with B:CIVIC that they diverted over 90% of their rubbish from landfills. This was through initiatives like composting, recycling and CHaRM, the Center for Hard-to-Recycle Materials. CHaRM is a facility that collects unusual materials (foam, electronics, cooking oil, plastic bags, etc.) for reuse and recycling. CHaRM was the first facility of its kind and is located in Boulder. Outside of their waste diversion Ocean First just completed their B Corp Recertification as the only certified B Corp dive shop in the world. supporting our local B:CIVIC businesses committed to giving back and being a force for good. For more information please see Ocean First. 75,000 Volunteer Hours in 1 Year: Can Crowe Horwath do it?